According to the study, "Corrosion Costs and Preventive Strategies," the cost of corrosion in the U.S. is a staggering $276 billion per year. The shipping industry alone accounts for $2.7- billion, broken down into new ship construction — $1.1 billion, maintenance and repairs — $0.8 billion, and corrosion-related downtime — $0.8 billion. This study was initiated by NACE International — The Corrosion Society and mandated by the U.S. Congress in 1999 as part of the Transportation Equity Act for the 21st Century (TEA-21), and conducted by CC Technologies Laboratories, Inc, with support from the U.S. Federal Highway Administration (FHWA) and NACE. 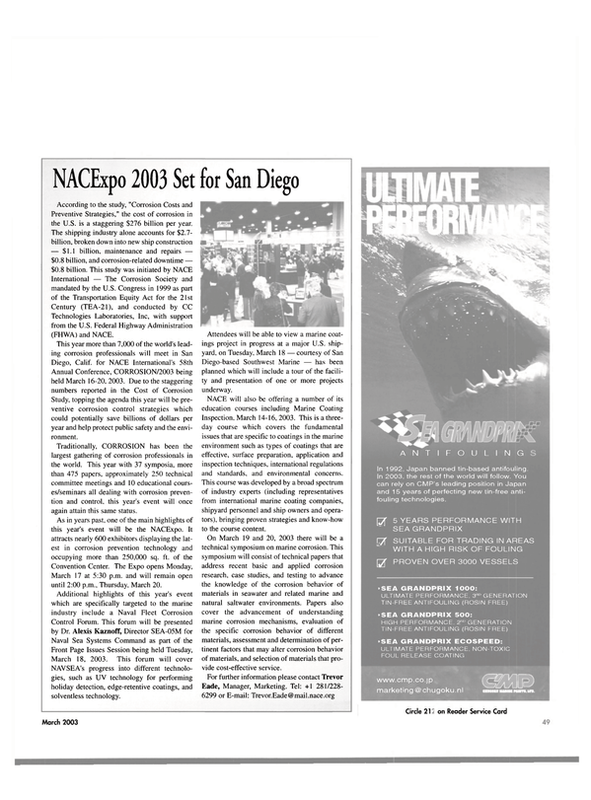 This year more than 7,000 of the world's leading corrosion professionals will meet in San Diego, Calif, for NACE International's 58th Annual Conference, CORROSION/2003 being held March 16-20, 2003. Due to the staggering numbers reported in the Cost of Corrosion Study, topping the agenda this year will be preventive corrosion control strategies which could potentially save billions of dollars per year and help protect public safety and the environment. Traditionally, CORROSION has been the largest gathering of corrosion professionals in the world. This year with 37 symposia, more than 475 papers, approximately 250 technical committee meetings and 10 educational courses/ seminars all dealing with corrosion prevention and control, this year's event will once again attain this same status. As in years past, one of the main highlights of this year's event will be the NACExpo. It attracts nearly 600 exhibitors displaying the latest in corrosion prevention technology and occupying more than 250,000 sq. ft. of the Convention Center. The Expo opens Monday, March 17 at 5:30 p.m. and will remain open until 2:00 p.m., Thursday, March 20. Additional highlights of this year's event which are specifically targeted to the marine industry include a Naval Fleet Corrosion Control Forum. This forum will be presented by Dr. Alexis Kaznoff, Director SEA-05M for Naval Sea Systems Command as part of the Front Page Issues Session being held Tuesday, March 18, 2003. This forum will cover NAVSEA's progress into different technologies, such as UV technology for performing holiday detection, edge-retentive coatings, and solventless technology. Attendees will be able to view a marine coatings project in progress at a major U.S. shipyard, on Tuesday, March 18 — courtesy of San Diego-based Southwest Marine — has been planned which will include a tour of the facility and presentation of one or more projects underway. NACE will also be offering a number of its education courses including Marine Coating Inspection, March 14-16, 2003. This is a threeday course which covers the fundamental issues that are specific to coatings in the marine environment such as types of coatings that are effective, surface preparation, application and inspection techniques, international regulations and standards, and environmental concerns. This course was developed by a broad spectrum of industry experts (including representatives from international marine coating companies, shipyard personnel and ship owners and operators), bringing proven strategies and know-how to the course content. On March 19 and 20, 2003 there will be a technical symposium on marine corrosion. This symposium will consist of technical papers that address recent basic and applied corrosion research, case studies, and testing to advance the knowledge of the corrosion behavior of materials in seawater and related marine and natural saltwater environments. Papers also cover the advancement of understanding marine corrosion mechanisms, evaluation of the specific corrosion behavior of different materials, assessment and determination of pertinent factors that may alter corrosion behavior of materials, and selection of materials that provide cost-effective service.